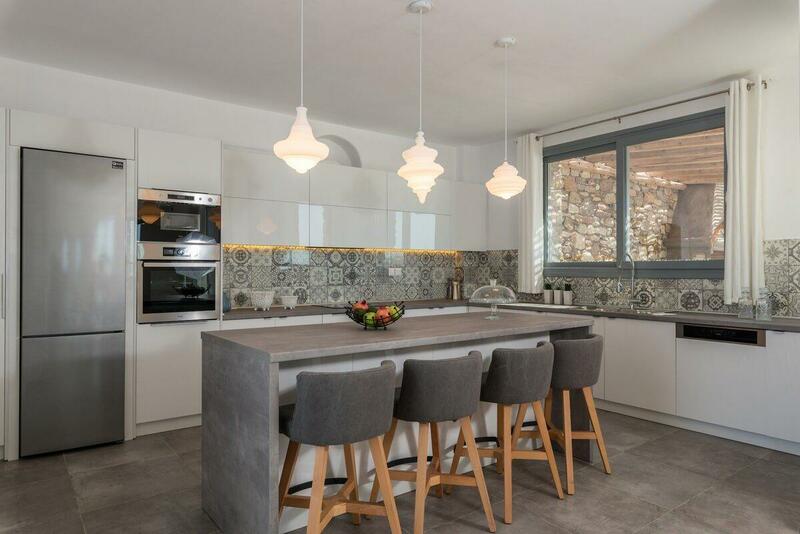 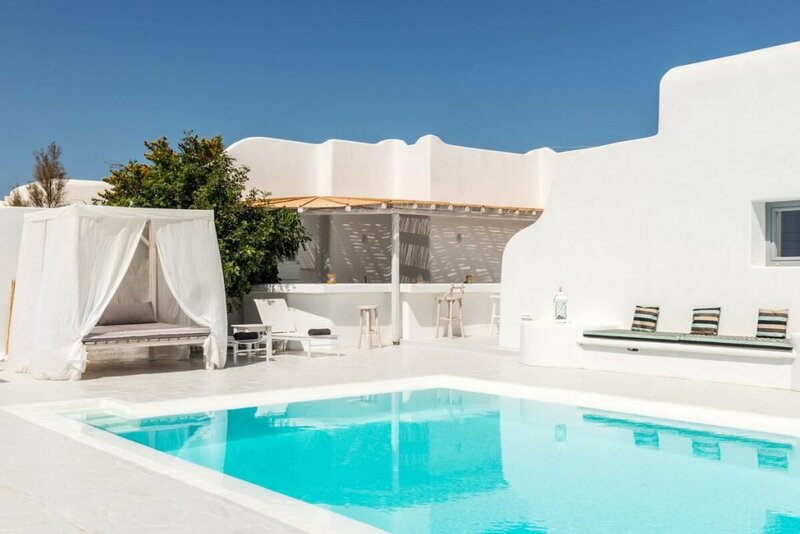 Villa Matheo consists of 5 bedrooms, a large fully equipped kitchen with a breakfast bench, a swimming pool (12m x 6m) equipped with sunbeds, seating areas throughout, outdoor dining area with BBQ and seating area all covered with pergola, pergola covered bar and seating area next to the pool. 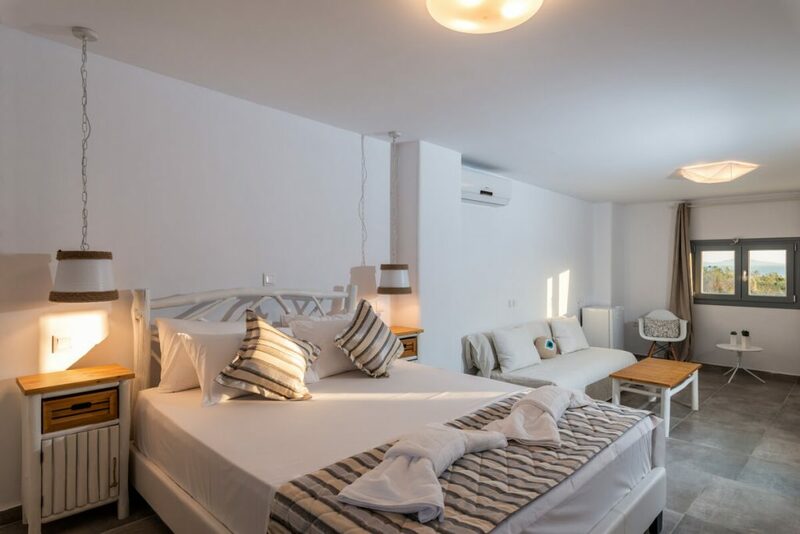 The residence has Wi-Fi, Smart TV’s in all bedrooms, and safety boxes in all bedrooms, the house also has a central AC unit system. 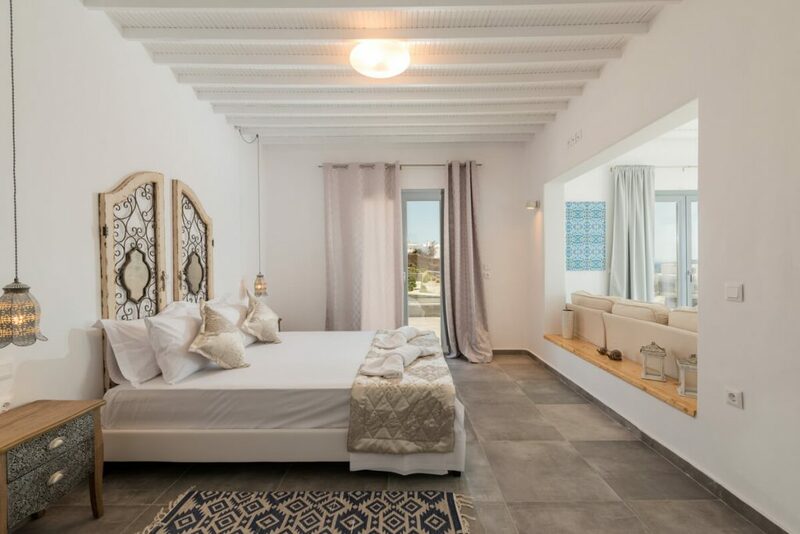 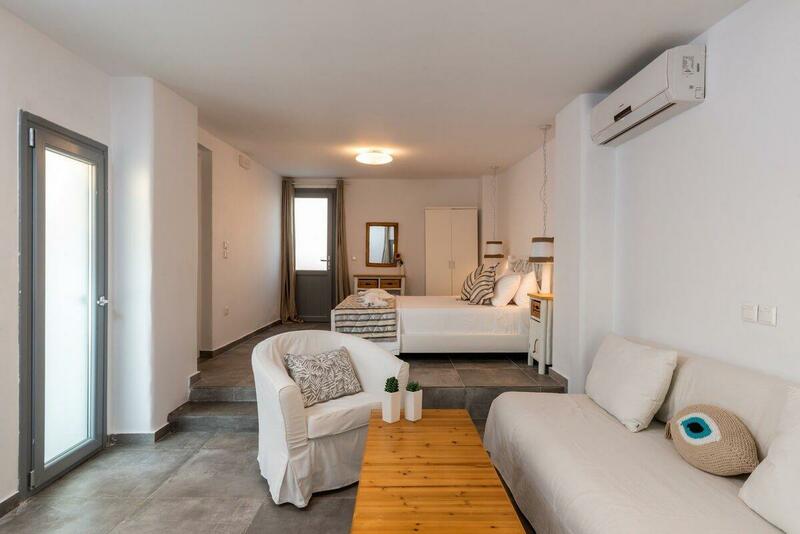 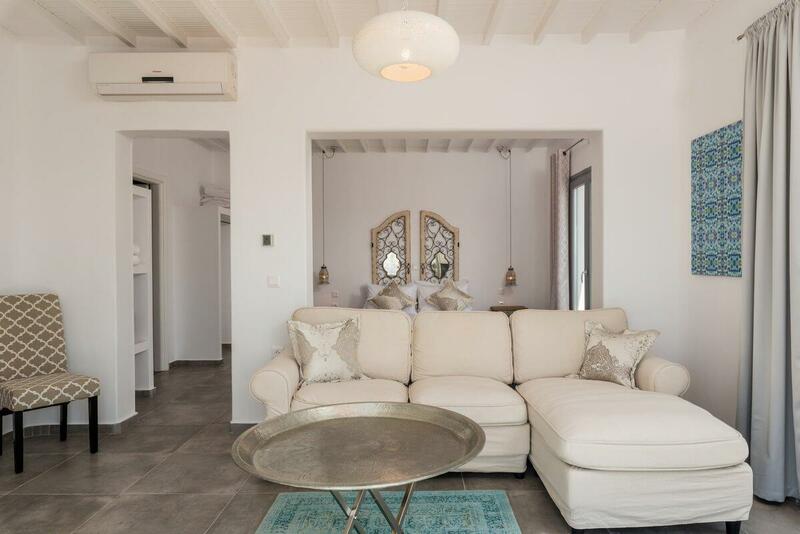 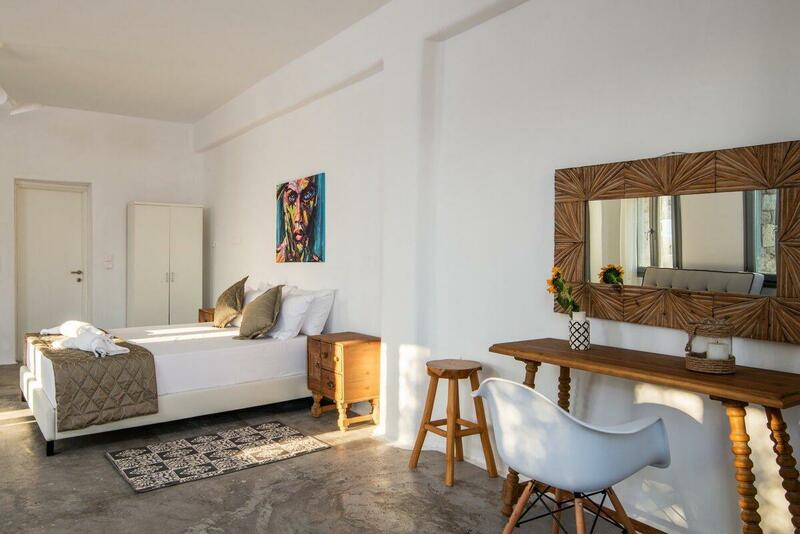 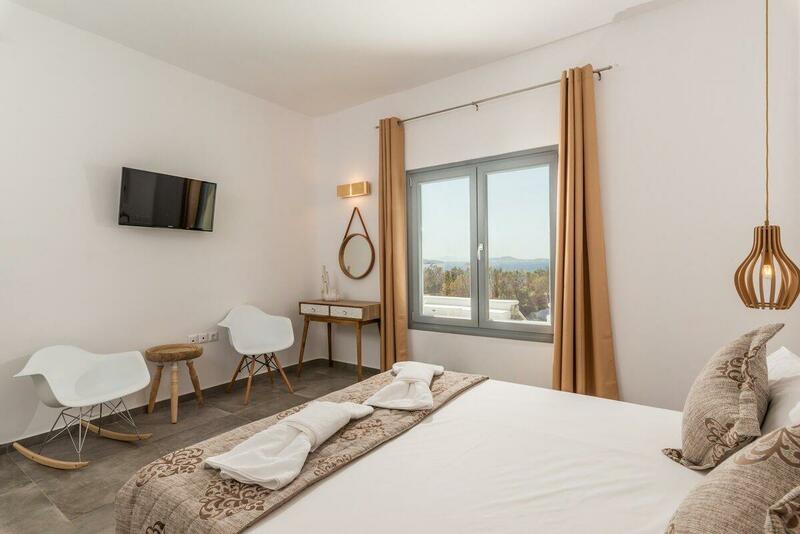 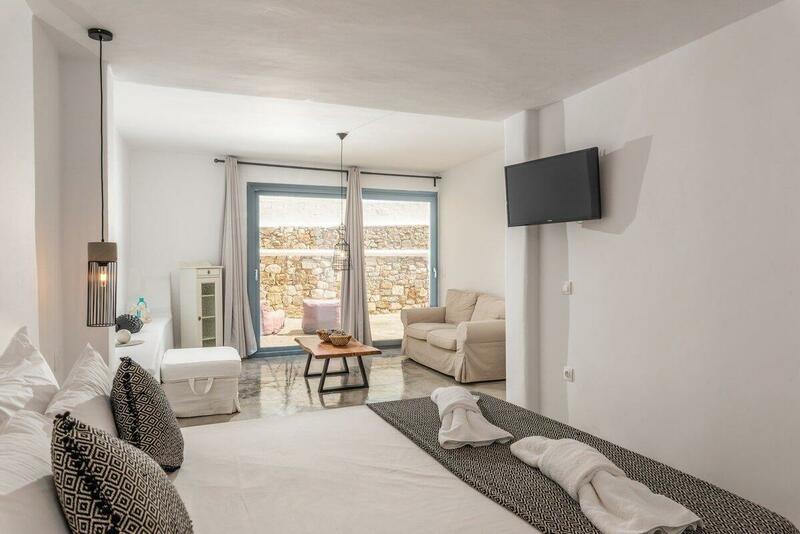 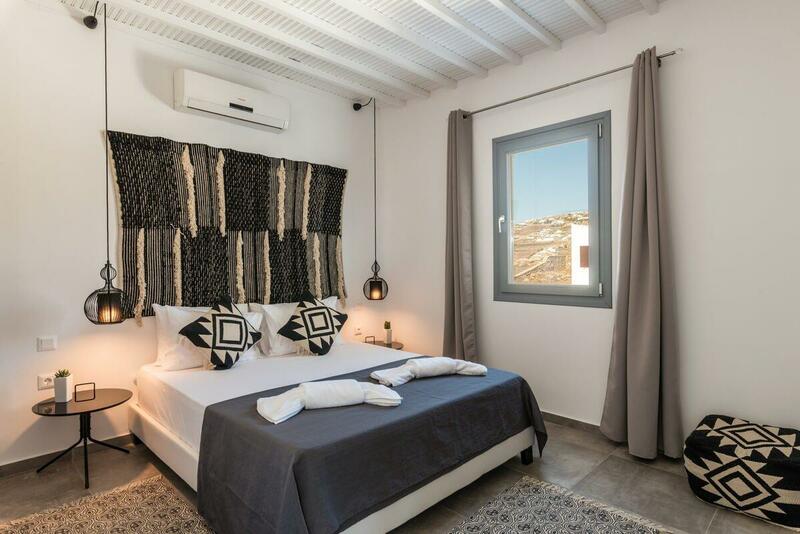 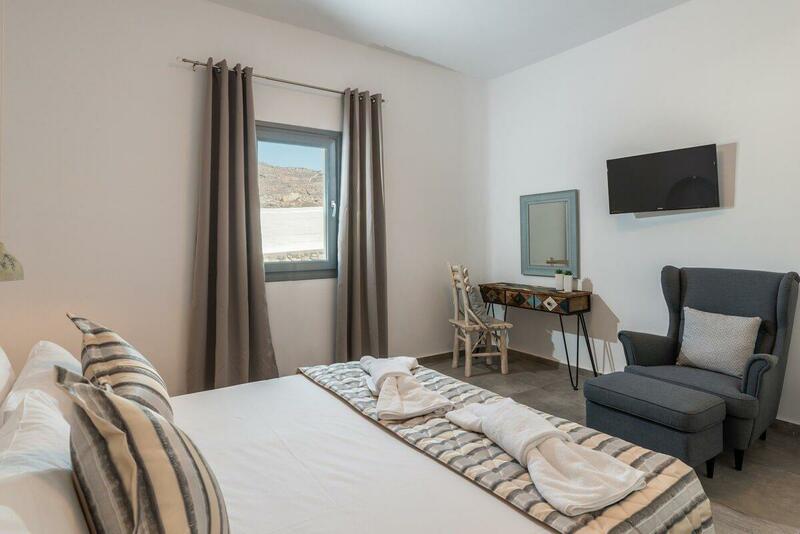 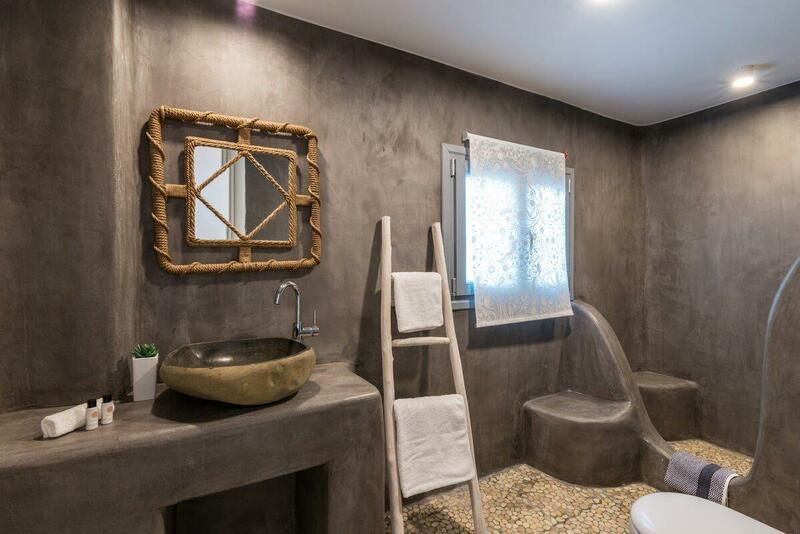 In addition to the main villa there are 2 guesthouses located around the pool area equipped with a fridge, en-suite bathrooms and a private living room. 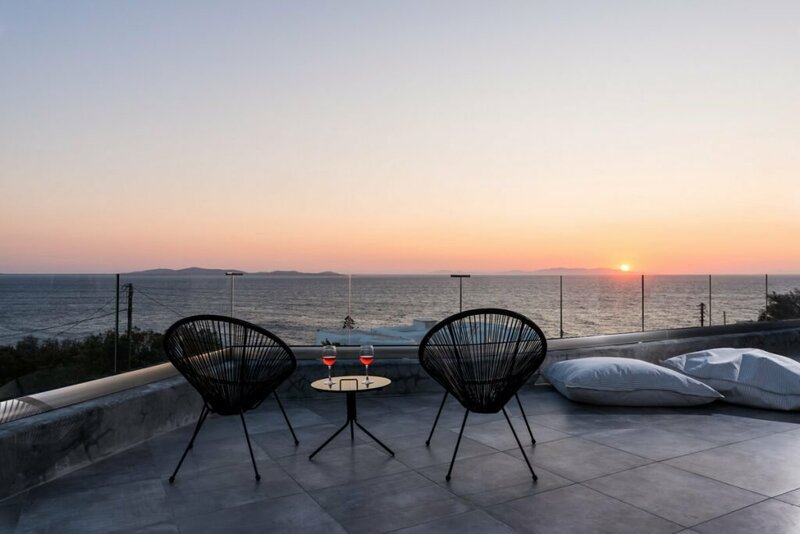 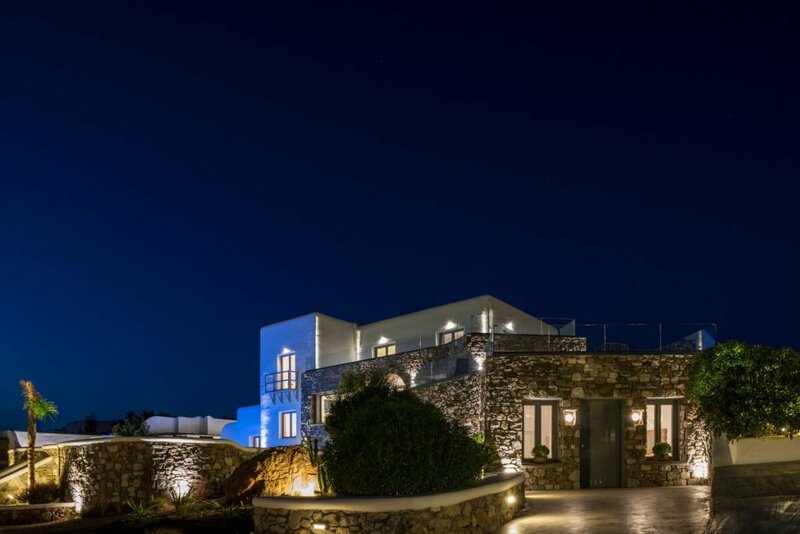 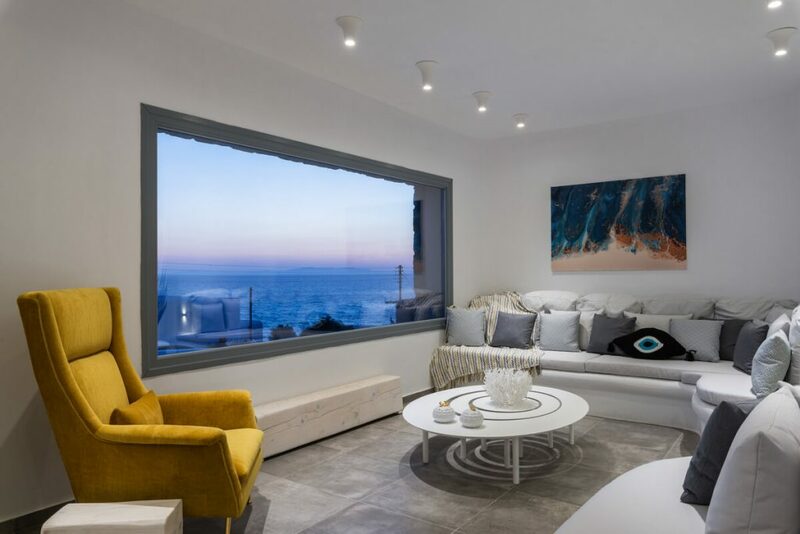 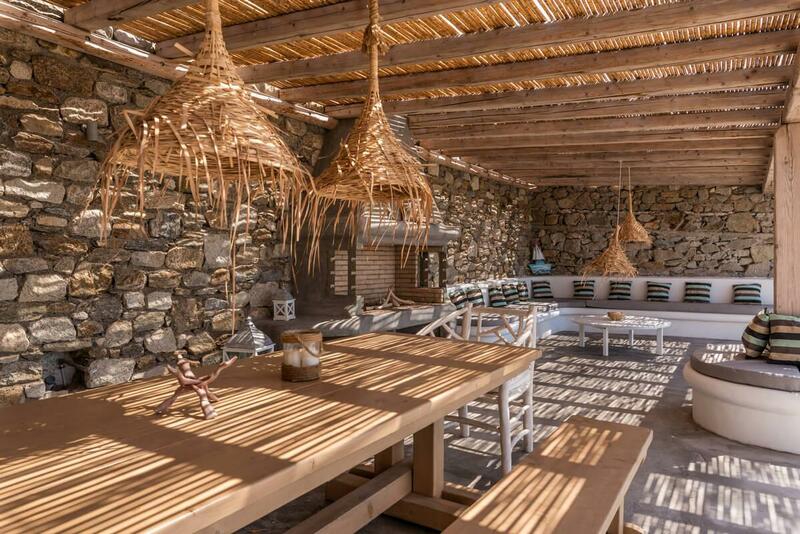 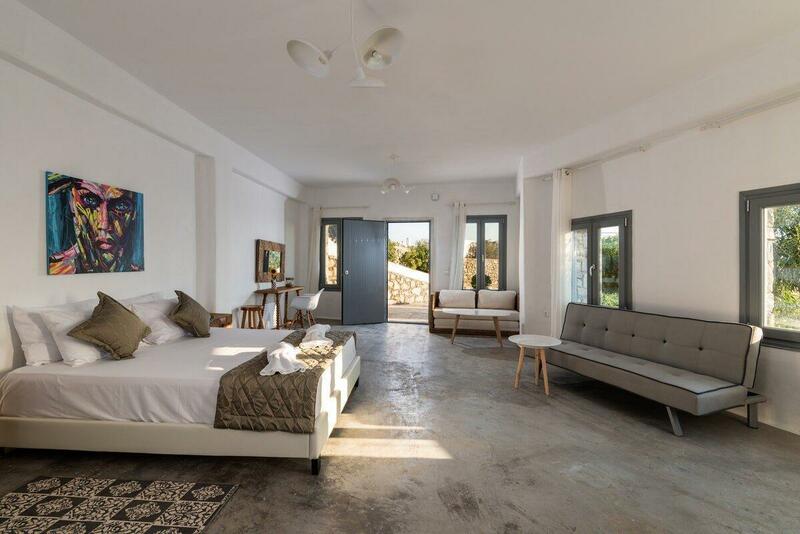 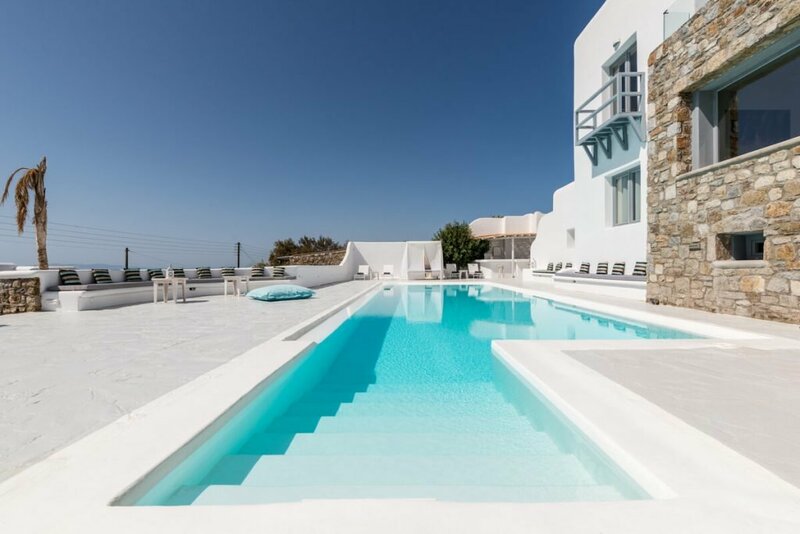 The residence has two balconies, one on the first floor, which extends around the house (160m2) and the second on the ground floor on the front side (both balconies overlooking the sea, Tinos and Mykonos). 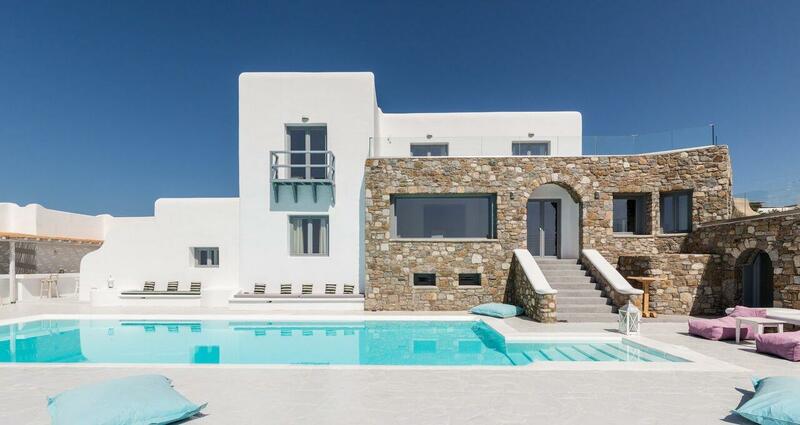 The villa can accommodate 14 guests. 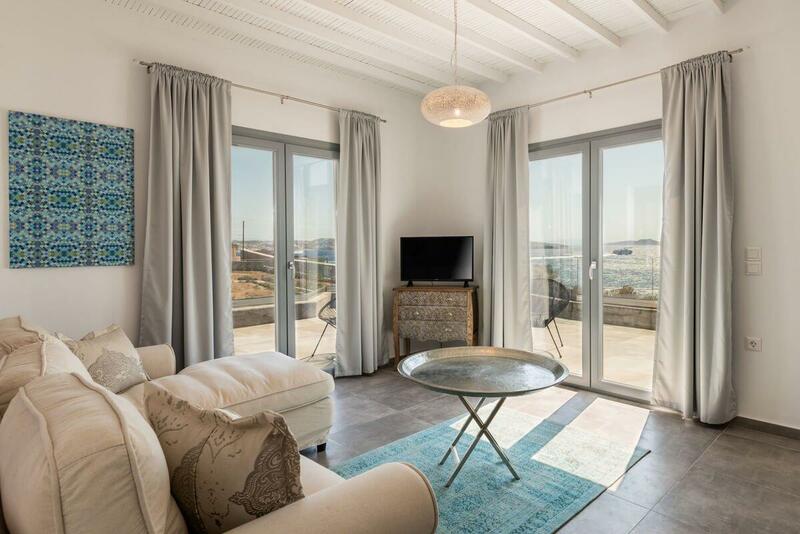 There is the main living room with balcony doors leading to the pool, balcony and exterior dining area. 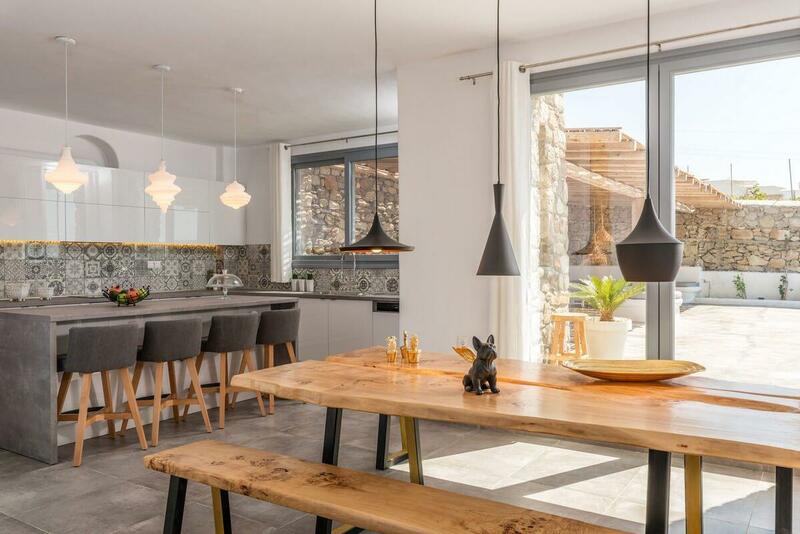 Also the interior dining area is located in this floor next to the fully equipped kitchen (all electrical appliances including wine cooler). 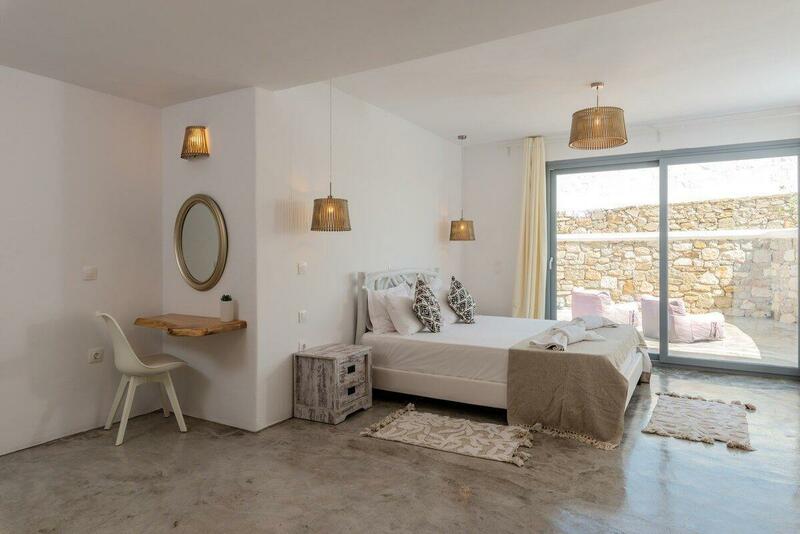 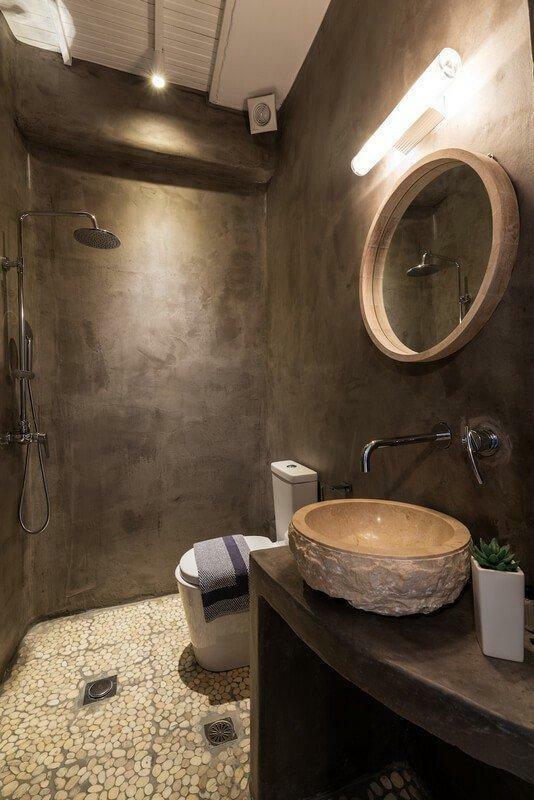 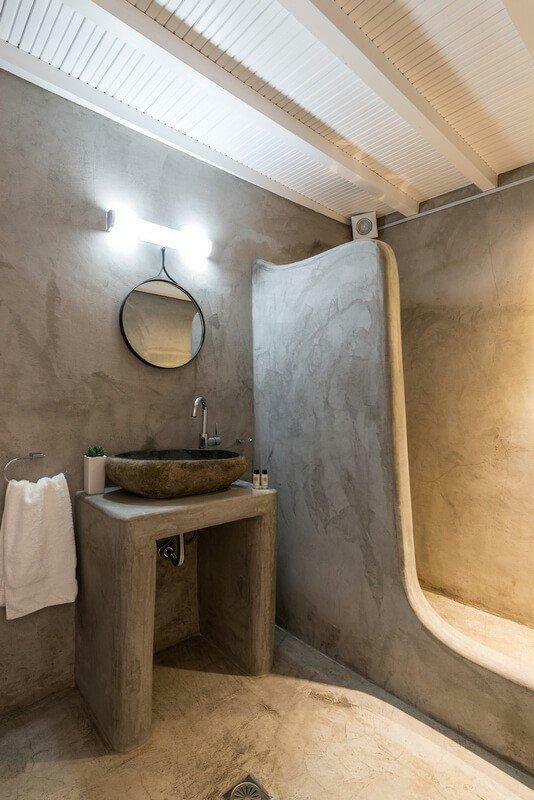 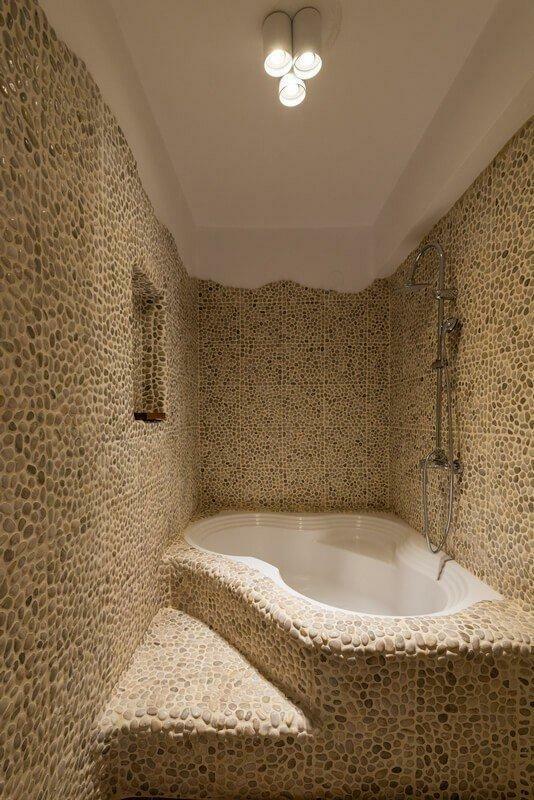 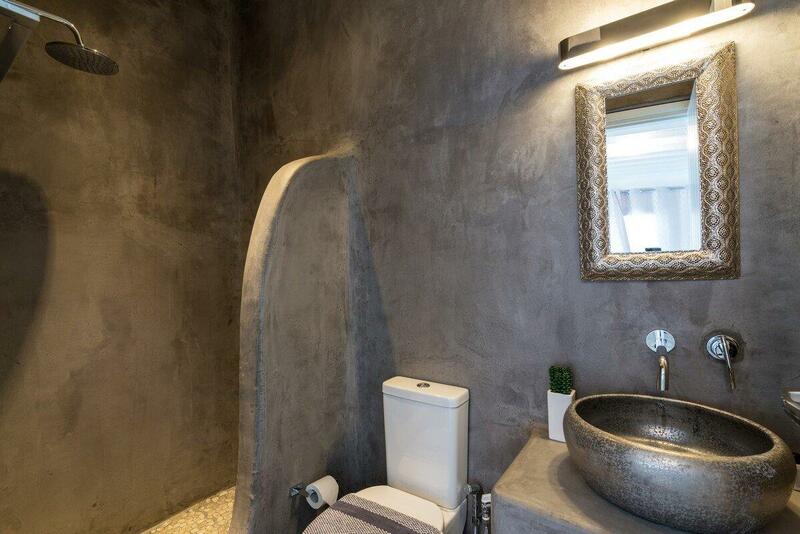 In this floor there also two double bedrooms with a large bathroom extending in two areas equipped with bathtub. 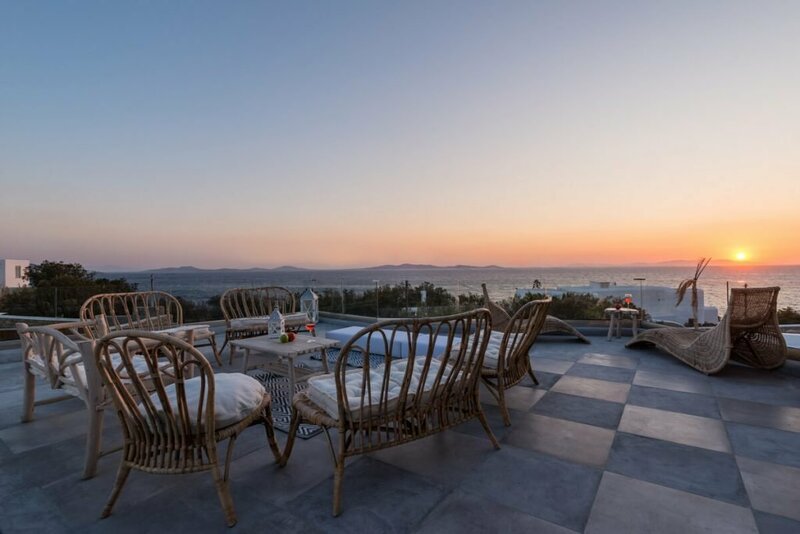 In this floor there is the bar with a small lounge area around it with balcony doors leading to the main balcony of the house with 180° view. 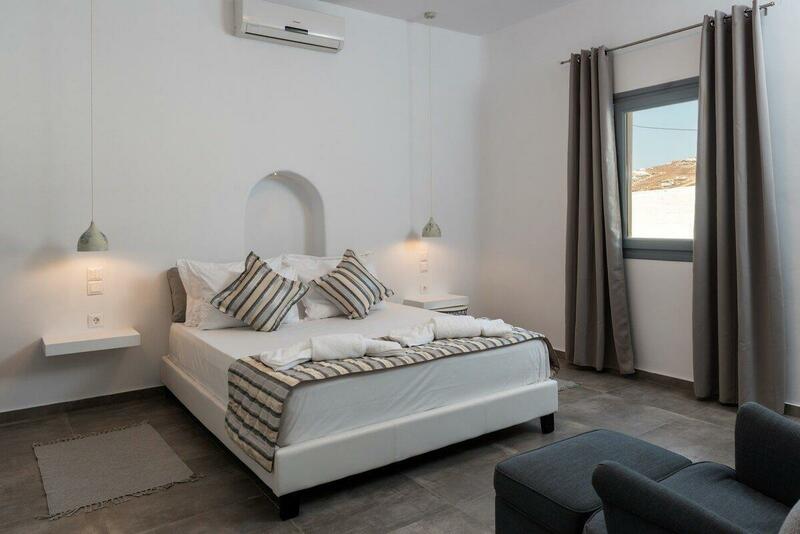 The master bedroom is also located here with great sea view, en-suite bathroom and access to the large balcony of the house. 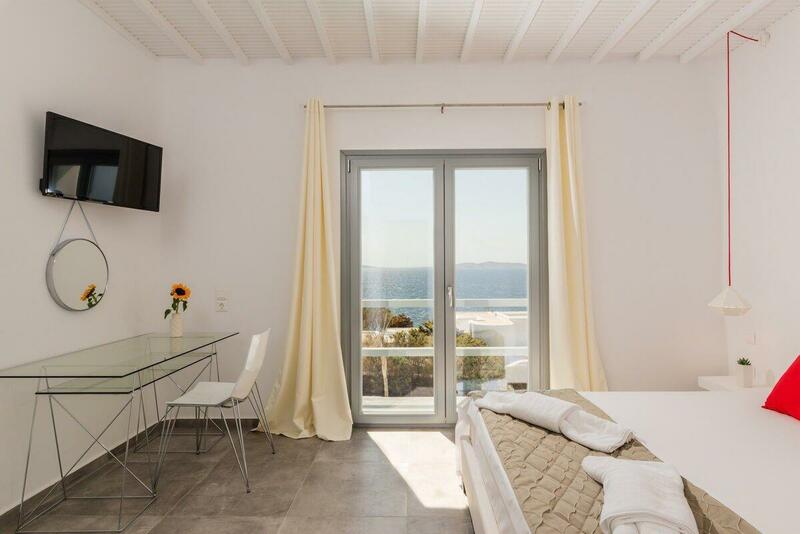 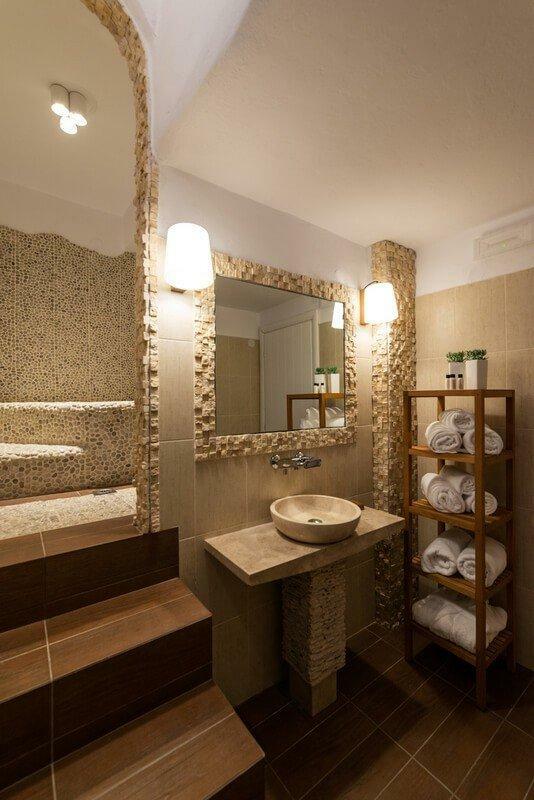 On the same floor there are another 2 double rooms with en-suite bathrooms, with sea views. 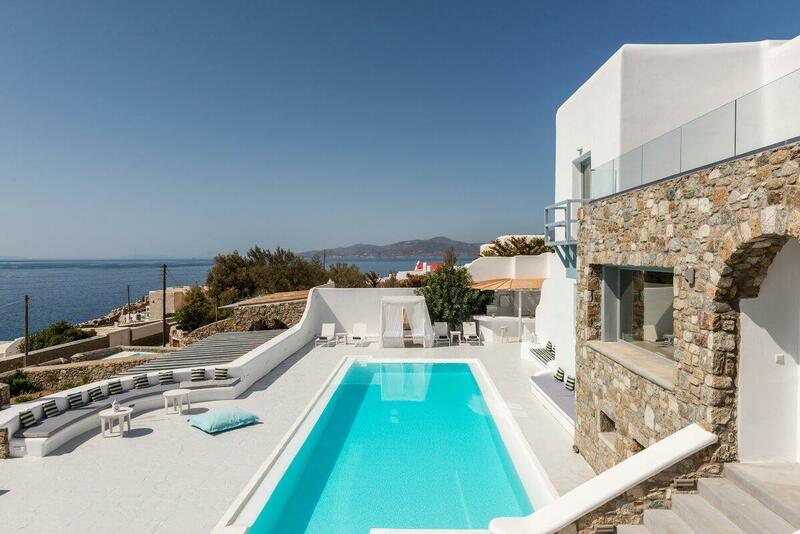 On the outside there are still two more rooms overlooking the pool with their own living room and en-suite bathroom. 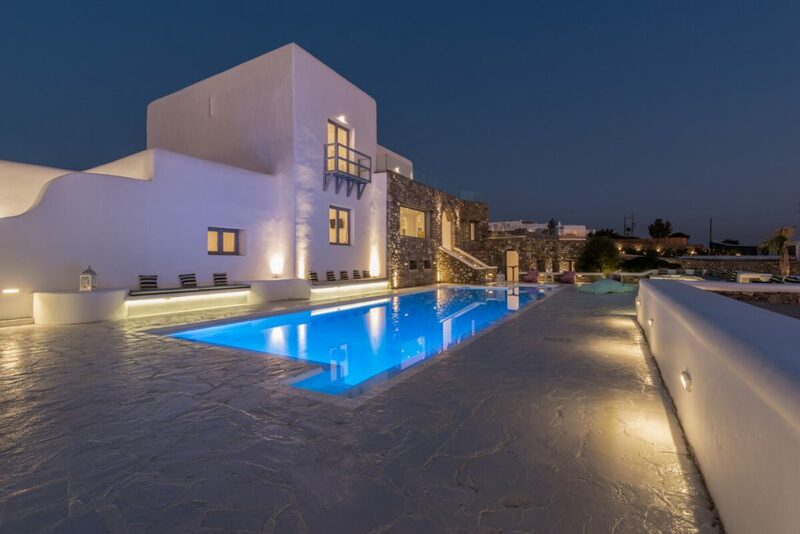 The swimming pool (12m x 6m) is located on the front of the house with built-in sofas around it, a bar and sun loungers. 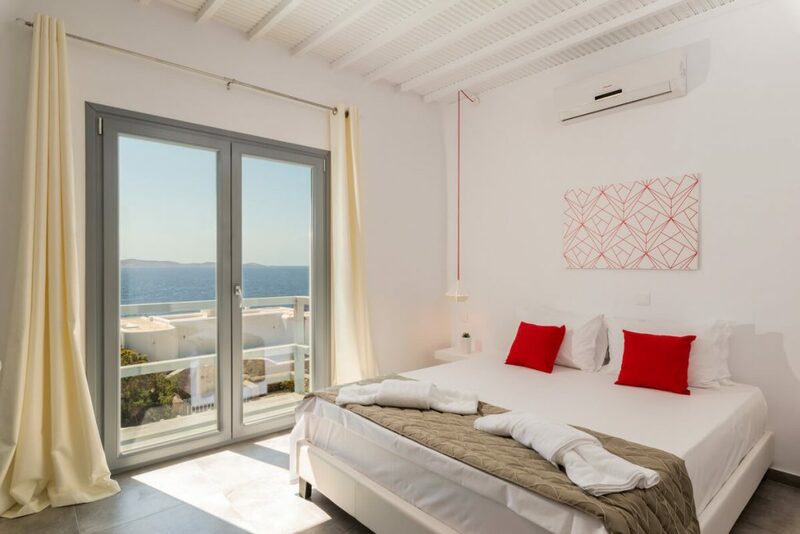 Payment policy: 50% deposit upon booking; 50% to be paid 60 before arrival. Smoking not allowed in any inside area of the house.